Announcement Hello & Welcome! We make safe and fun toys for bunnies, guinea pigs, hamsters, chinchillas & birds. We do not use glue, nails nor staples. 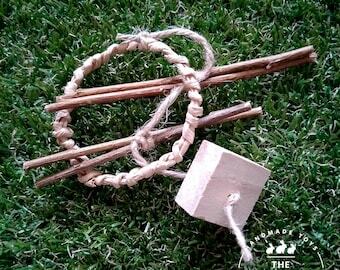 We use natural materials such as wood, hay, grass, willow, paper and linen. We keep our toys in its natural colour, no add-ons or colourings/dyes are used. 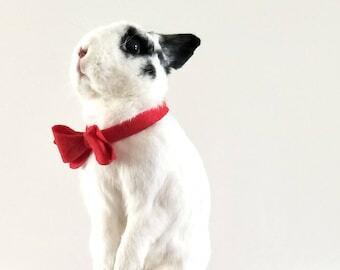 We also make bunny-themed goodies for humans and more! 100% handmade. Shop for a good cause today! Parts of our proceeds will be donated to animal rescue and welfare groups. Occasionally, we will donate toys to our beloved animal friends. Hello & Welcome! 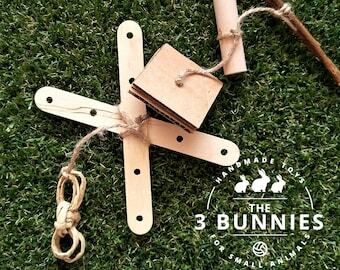 We make safe and fun toys for bunnies, guinea pigs, hamsters, chinchillas & birds. We do not use glue, nails nor staples. 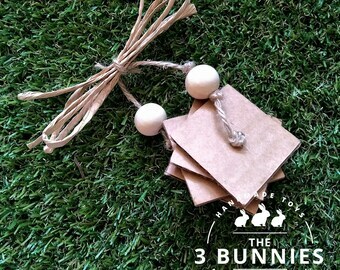 We use natural materials such as wood, hay, grass, willow, paper and linen. We keep our toys in its natural colour, no add-ons or colourings/dyes are used. Trippe had fun exploring with his chew toy :) thank you! 20% OFF on all toys! Check out our new Fabric Notebooks! Great for sketches, illustrations, diaries and school! Fundraising project. Rabbit bunny fabric pins. One happy customer :) Our toys are safe for hamsters too! I started making toys for my own bunnies when I found out commercial toys contain a lot of dyes and colourings, as well as non safe materials such as metal and glue. Rabbits like to chew and "eat" things; so if colourings/dyes are eaten, it's not good for their tummies. I use all 100% natural and safe materials without colourings, dyes, metal, nor glue in making the toys. Watch them play, toss & destroy! I'm sure your bunnies will have lots of fun! Hi There! Here, you'll find all sorts of handmade goodies and toys for small animals - rabbits, guinea pigs, hamsters, chinchillas & birds. We use all natural materials. No preservatives and no colouring are used. Note: All toys cannot be returned for hygiene purposes. We accept returns & refunds for accessories only if we feel that our products is technically defective. By purchasing any of these products, you agree with this disclaimer. Refunds will be made via Paypal, or the payment method which you have made your purchase. Please contact us if you need a replacement or refund. Payment is done though Paypal & Etsy Payments. All payments must be completed prior to shipping. If you would like to cancel your order, simply contact us via Etsy, thank you. Our products are shipped from Singapore. We will ship within the production time listed listed. Your items are shipped from Singapore, the shipping fee is for normal mail (Singapore) and normal air mail (International). You can opt for Registered Mail upon checkout (+S$2.50 flat rate). We strongly recommend Registered Mail for all international orders. We are not responsible for any items lost during postage. Based on our past shipments, international orders will take 7-30 business days to arrive to your country. When the item has arrived to your country, it will pass the customs, then sorting, etc. If your item is delayed, please contact your local post office with the same tracking number provided. Please understand the delay is not from us. Thank you. If the shipping fee is overcharged, we will contact you and reimburse you the excess amount. Please note our toys are not 100% guaranteed to motivate your animal's playfulness or interest. It all depends on your animal's personal character. Some animals may like to toss and throw toys, and some don't.